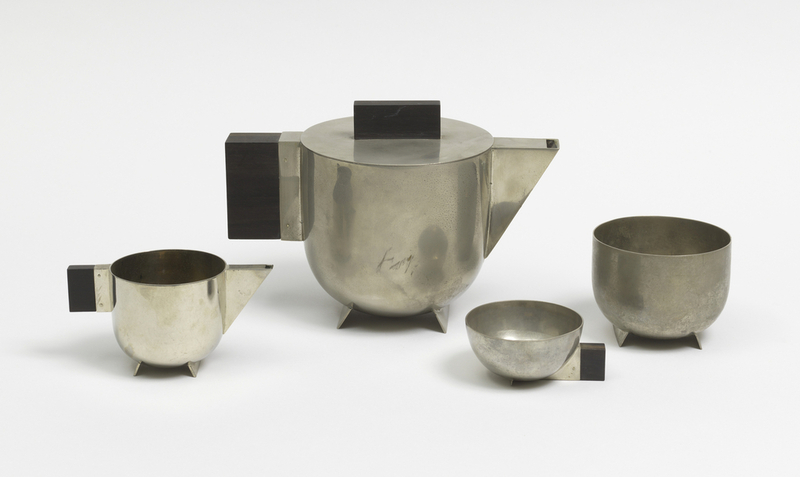 This Austrian tea service was designed in a thoroughly modernist style. Forms have been radically simplified to their stark geometric essence. The pieces have no applied ornament, adhering to the principle of “form follows function”, one of the central tenets of modernist industrial design. Following the First World War, new economic and social conditions made heavily-ornamented luxury goods unsuitable for many people. Made from nickel-plated brass, this set could be manufactured at a minimal cost — a crucial factor in the deflated European post-war market. The gleaming undecorated surface possesses a machine-like aesthetic that lends itself to industrial manufacturing. The modernist style was truly international in scope; metalworkers throughout the world produced table wares in this reductive mode. This design has stylistic affinities with the German designers Marianne Brandt and Karl Heubler, the French designers M. Desnet and René Nauny, and the American designers Ilonka Karasz and Jean George Theobald. This tea service can be seen in Ellen DeGeneres Selects, on view through May 21, 2017. Rebekah Pollock is a decorative arts historian specializing in European ceramics and eighteenth-century print culture.